Cheap varicose veins treatment can be very tempting. Indeed, we now live in a society where people often look at price rather than quality. Many people forget veins are part of the circulatory system. You often hear people say that varicose veins are “only cosmetic”. This is wrong. When varicose veins are treated properly, patients get tremendous health benefits. The REACTIV trial has proven this. proper treatment of venous reflux means that varicose veins disappear. In addition, we can stop deterioration to skin damage, swelling and leg ulcers. Unfortunately, many doctors performing varicose veins treatments are not consultant venous specialists. As such, they do not follow protocols such as The Whiteley Protocol. They often use one technique such as just foam sclerotherapy or just endovenous laser or radiofrequency. Although this may look good on the surface in the short term, the underlying cause is often untreated. This results in a high recurrence rate in the future. In this case, the patient had severe skin marking due to the inadequate treatment. The doctor who performed the treatment, told her that this was “bruising”. The discolouration is caused by a clot in the vein. When foam sclerotherapy is used in large veins, it increases the risk of these clots. We saw this on duplex ultrasound. This scan also shows that there is still reflux in the great saphenous vein and the perforator. Unfortunately for this lady, this clot will dissolve over the next year or two. She will end up with the same vein back again and also have brown stains of the skin! This is a typical case that illustrates the frequently quoted “Buy cheap, buy twice”. Treated by the Whiteley Protocol, would have avoided this brown staining and would have given a better result. Following the Whiteley Protocol, she would have had a venous duplex ultrasound scan performed by a specialist vascular technologist. This would show that the veins are too large for just foam sclerotherapy alone. 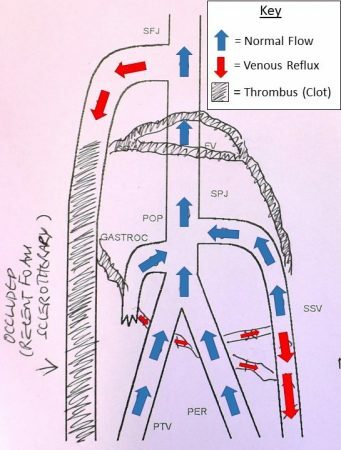 This pattern of venous reflux needs endovenous laser ablation or radiofrequency ablation, with TRLOP. This would be stage I of the Whiteley Protocol. Some eight weeks later, she would have then had the remaining small veins. 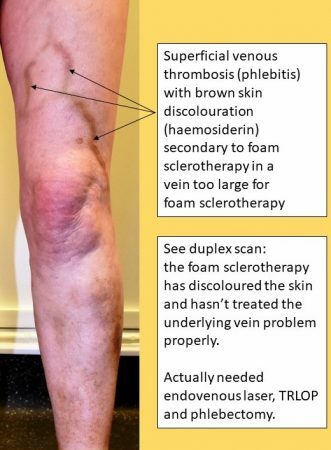 Foam sclerotherapy then treats these successfully – stage 2 if the Whiteley Protocol. Fortunately, she has come to us for treatment of the right leg. We will treat this with the Whiteley Protocol and she will see the difference between the legs. In the future, when this superficial clot dissolves, we will then be able to treat the left leg properly. Legally, medical treatments should be carried out in regulated premises by trained professionals. Medical equipment is expensive because it has to be safe and go through rigorous testing. Because of these factors, there will always be a minimum cost for proper medical treatments. This is important in many areas, but none more so than your circulatory system. Blood flows from the veins back to the heart and lungs. Therefore you really do not want anything put into the veins that is substandard in any way. In the current climate, doctors, clinics and hospitals are trying to offer cheap varicose veins treatment. However, how can costs be cut without reducing quality or safety? The most common way to make varicose veins treatments cheap is to let doctors do their own duplex ultrasound scan. If you do not pay a vascular technologist to do a proper duplex ultrasound scan, it is much cheaper. However, you end up missing important causes for varicose veins. In this case, both the incompetent perforator and top of great saphenous vein remained untreated. The next most common way is to offer only one treatment modality. This might be just foam sclerotherapy as in this patient, or just endovenous laser ablation and phlebectomy in others. Research and audits at the The Whiteley Clinic have shown that we have low recurrences in the long term. We achieve this by using combinations of treatments and treating all of the underlying problems. We want good short and long-term results. This is why we treat our patients by The Whiteley Protocol.